I'm not really into putting on costumes, but I appreciate that this is the time of year when you're supposed to do it. That's why I went to a Halloween party a couple of years ago wearing a custom-made t-shirt that said: "This is my costume." If you're a tee-loving dork like me, there are actually better options that that. Here are just a few. 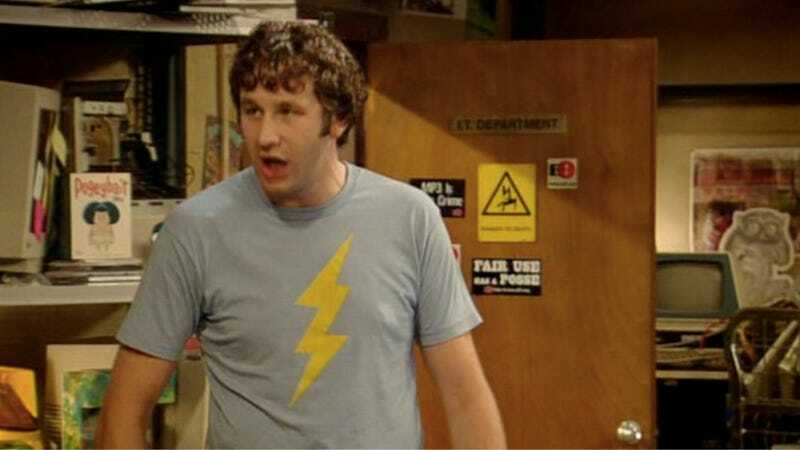 Of course, the easiest t-shirt costume of all is to go as Roy from The IT Crowd (above), whose geeky t-shirts are the stuff of television legend. (Seriously, Sheldon's tees on Big Bang Theory are nothing compared to Roy's.) You can get his nice Flash t-shirt on Zazzle for $23.60 (though not in the same color), or read through the meticulous guide to finding some of his other classic tees (such as the "Meh." one) on Hide Your Arms.